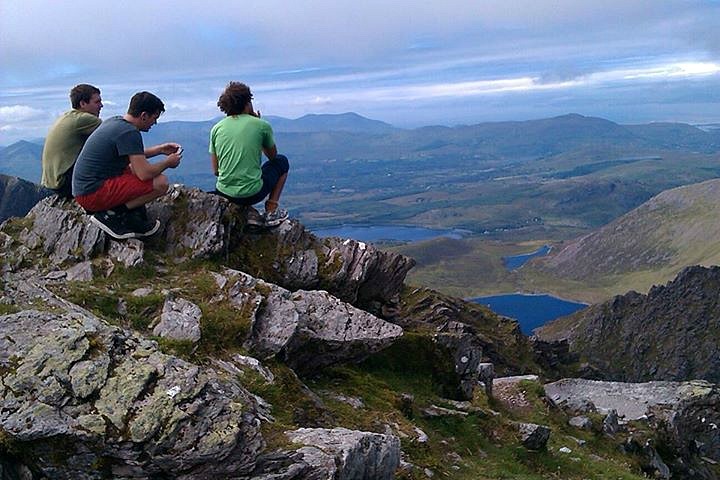 A walk in County Kerry is more than great exercise, though great exercise it is. It is more than a dose of fresh air, though it is hard to find fresher. It is more than the natural environment, though you will be surrounded by beaches and mountains, islands and coastal cliffs, valleys of hedgerows and farmland. A walk in County Kerry will provide peace and quiet and the perfect environment for positive thoughts to flourish. It’s all about how deep you want to go. One may visit West Kerry and walk the famous Slea Head route viewing a kaleidoscope of stunning scenery. Your feet keeps moving one after the other and you too move on, left with a slightly melancholic feeling having experienced the beauty so briefly. Now walk to Slea Head. Walk through varied landscape, gaze at the waters of Ventry Bay as you stroll the beach with Mount Eagle in the fore ground. Take it all in. Notice the Norman Fort, Rathinane Castle. Take a deep breath. Hear the sounds, waves, birds and conversation. As you make your way west at this perfect pace you enter the landscape. Onto mountain tracks with the Skelligs on the horizon and sheep grazing close by, thinking, talking, not thinking, you reach Slea Head and you’re ready. No comparison. It’s all about time. The rhythm and pace of walking lend themselves to good conversation and when you throw the inspirational scenery of the Dingle Peninsula or the Ring of Kerry into that mix it all adds up to a great place/space to spend time with friends and family or just go solo. You could always let an experienced tour guide like Kevin O’shea, with 20 years experience and a wealth of knowledge, take you over Ventry Strand and across Com Dhineol Beach overlooking the Blasket Island archipelago, retelling stories of Fionn Maccumhail. the Vikings, the Celts, the mythology and history of the Dingle Peninsula and much more, all while walking through a taste of paradise. The DINGLE WAY — Sli Chorca Dhuibhne — is a diverse and beautiful walking trail, full of surprises for those who wander its paths. During a week’s rambles over The Dingle Way, you`ll encounter panoramic vistas of sea, mountain and islands, a profusion of unique birds, plants and unspoiled landscape, and an astonishing array of ancient sites spanning 6000 years. Along its 178km (110 mile.) length, The Dingle Way traverses pristine sandy beaches bordering on crystal seas. fuebsia and gorse lined green roads leading through pastoral countryside, heather and bracken covered hills, and mountain passes up to 700 meters (2000 ft.) high- Here, where ancient Bronze Age and Celtic peoples lived for thousands of years, you can enjoy gannets and shearwaters in endless flight above wave battered cliffs, or laugh at rare, red—footed and red-beaked chough dabbling amongst purple Devonian sandstone boulders along the shore. On another day you might delight in multiple rainbows over a verdant patchwork quilt of field and stone as you pause and refresh in the cool quiet glen of an ancient sacred well. The days will pass all too quickly as you explore the magical Kingdom of Kerry! THE KERRY WAY is a beautiful walking trail which meanders through Irelands largest peninsula, Iveragh. Along this 135 mile way marked by inland river valleys and gouged out by glaciers during the last ice age. You will continue through some of Irelands finest Oak Woods described as being the nearest thing in Ireland or Britain to temperate evergreen rainforest. You will cross mountain passes and follow mountain trails which give startling perspectives of the surrounding land, seas and islands and out to the Atlantic Ocean. You will follow a coastline full of inlets and bays, beautiful sandy beaches and unforgiving cliffs. You will enjoy the hospitality and warmth of the towns and villages of South Kerry which developed here throughout the ages. Glenbeigh — Cahirciveen — Waterville— Caherdaniel — Derrynane — Sneem — Kenmare and Killarney. You will walk past the rich archaeological remains which tell the story of the people who lived in the Kingdom of Kerry down through the years and you will marvel at the flora and fauna which changes around each turn in the trail. Walking will lift your spirits and open up a new world. Take the time!